In a round led by IDG Ventures India, Heckyl Technologies raised more than $3.5 million in new capital. Also participating in the round were Seedfund Advisors, a previous investor, and angel investor, Rajiv Dalal. The company’s total funding now stands at $4.75 million. Heckyl Technologies provides real-time financial information and analytics for researchers, traders, and investors. Their platform includes news, market, sentiment, and predictive data analysis, covering more than 35,000 companies and more than 3,500 non-listed entities around the world. The company made headlines earlier this year for taking first place at the UK Trade & Investment contest in June. Heckyl also was named the fastest growing enterprise startup in the Indian brokerage industry. 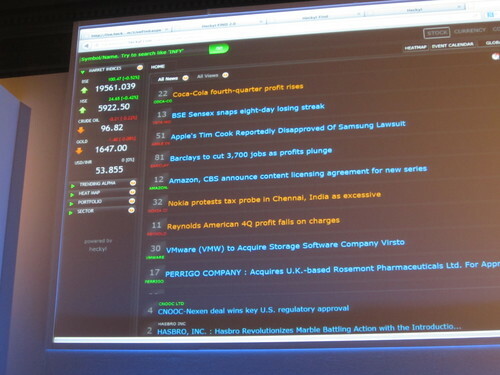 Founded in 2010, Heckyl Technologies demoed its FIND 2.0 (Financial In News & Data) technology at FinovateEurope 2013. See the company in action here. Heckyl Technologies featured in Startup Innovation. U.S. Bank’s Mitek-powered Mobile Photo Bill Pay wins Best Technology Initiative in Banking award. Independent Research Group names Cardlytics a Best in Class Provider in 4 categories of card loyalty technology report. Ally Bank adds Fiserv’s Popmoney to power recurring funds transfers on its mobile app. PayPal now accepts prepaid gift cards. Mashable looks at HelloWallet as an easier way to save money. The Wall Street Journal reports online advisers like Jemstep enhance free services. Forbes features how Moven can be especially useful over the holidays. BankBazaar, a credit processing platform that allows banks to offer consumers 7-minute credit eApproval on retail credit products. CustomerXPs creates technology that proactively senses cross-sell, attrition, customer engagement and fraud in real-time. DemystData enables real-time analysis of big data from consumers and SMBs, allowing for improved interactions as a result of richer, more relevant information. Heckyl provides real-time financial information, news analytics, trend matrix, and heat maps for coverage of markets, companies, and businesses. TradeHero, a virtual trading community where the system models trades and ranks trader performance by proven returns on investment. Wipro, an information technology, consulting, and outsourcing company that delivers solutions to enable its clients to do business better. At this year’s FinovateAsia, while not all demoing companies are looking for funding, each will show up to the MAX Atria @ Singapore Expo stage with their newest technology. Want to learn more? Check out FinovateAsia homepage or get your ticket here to be a part of the event. LifeHacker takes a look at Wallaby’s mobile app. Nomis Solutions wins patent for price sensitivity models. Heckyl Technologies takes first place in UK Trade & Investment innovation contest. Billeo announces acquisition of ecommerce platform, Swag.io. Encap earns seven-figure investment from ProVenture Seed. Credit Union Times features Arxan. Money Marketing considers Narrative Science, Quantopian, Moven, MoneyDesktop and Jemstep. Zopa named Most Trusted Loans Provider at the Moneywise Customer Service Awards 2013. CU Broadcast interviews MoneyDesktop’s Bret Skousen. Heckyl Technologies named fastest growing enterprise startup in Indian brokerage industry. InvestorPlace interviews Flint Mobile CEO and co-founder, Greg Goldfarb. EyeVerify raises $2.3 million in Series A round. 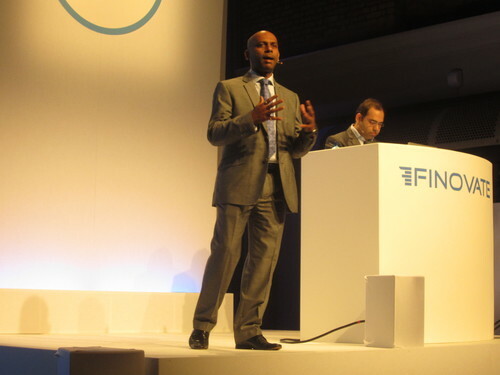 See them demo at FinovateSpring in San Francisco this week. Advanced Trading takes a look at Quantopian and the rise of the new quants. Meet them at FinovateSpring. FIS to provide core banking, back-office processing support to UK-based Sainsbury’s Bank. “Heckyl FIND 2.0 (Financial In News & Data) is a real-time news and data analytic platform for retail traders and brokerages. FIND gets integrated with trading terminals to provide high quality information, visuals, heat maps of sentiment, and market data to help traders find the trading opportunities in this fast moving market. FIND helps you explore new ideas and keep pulse on the current business events/issues. Whether you are a short-term trader, investor, or fund manager, and whether you prefer equities, forex, or commodities, you will find a wealth of information that matters to ‘you’ streaming at your fingertips. Netbanker highlights Simple and Jwaala’s natural language search. Metaforic extends its app protection system to be compatible with the upcoming BlackBerry 10 operating system. The Financial Times features Kabbage. Plastyc powers online banking and payments services for H&R Block, launches new white-label service. Andera increases sales bookings by 59%, sees 5x increase in oFlows customers. Cambodia’s leading commercial bank adopts Temenos Group technology upgrade. Fiserv completes acquisition of Open Solutions. AppShopper features eDeposit’s first mobile app. Edelweiss Securities launches real time news terminal powered by Heckyl Technologies. Google Analytics touts Kapitall’s content experiments. The Financial Brand investigates how Mitek’s bill payment service can aid customer account switching. ShopKeep POS partners with Griffin Technology to launch iPad POS system with a built-in magnetic card reader. Fiserv selects Aconite’s Smart EMV Manager solution to enhance EMV card processing systems. LearnVest app reaches 100,000 downloads. SEO-Cart integrates PayLeap from Acculynk Direct, a division of Acculynk. Profile of Banno CEO in American Banker highlights recent partnership with ProfitStars. Phillip Capital signs Heckyl Technologies to integrate News and Sentiment analytic platform. CreditKarma, PayPal, Experian, Pageonce, and Manilla earn spots on Netbanker’s top 50 iPhone and iPad finance apps.